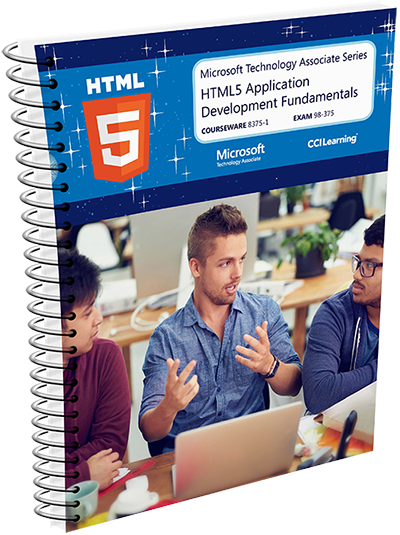 CCI Learning’s HTML5 Application Development Fundamentals courseware fully prepares students for Microsoft Technology Associate certification. HTML5 Application Fundamentals Courseware Solution. Our Teacher Resources enhance the learning environment by providing useful tools to prepare and enhance course delivery saving you valuable class preparation time. Designed for High School and College students pursuing careers in technology, this courseware directly prepares learners for MTA Exam #98-375. Students will gain a confident understanding of HTML5 client application development. Completion of this course leads to more advanced certifications such as the Microsoft Certified Solutions Associate (MCSA) or Microsoft Certified Solutions Developer (MCSD). Microsoft Certifications recognize and reward learners’ abilities and expertise as their careers develop. Whether new to technology, changing jobs, or a seasoned IT professional, becoming certified demonstrates a commitment to advancing skills and taking on greater challenges.